Requested by Castle Community Network, a resident led community based charity operating in the disadvantaged Castle area of Scarborough, Our Place is Our Place aims to specifically reduce crime and anti-social behaviour in four specific crime hotspots. By employing a local community organiser, who will establish local ‘street communities’ and deliver community events, it is the firm intention to build a closer, more united community to work with other teams combating anti-social behaviour. The Castle Community Network’s “The Base” opened on 6 October 2014. The North Yorkshire Police Rock Challenge 2015 delivers a positive message to youngsters in schools throughout the county using dance and drama. Ten schools can participate in each event, so one event can involve as many as 500 participants. The youngsters will be rehearsing outside of school hours, thus minimising the scope for offending and anti-social behaviour, have a drugs awareness input and on the day of the event and will attend police led workshops. Suggestions for the 2015 event are cyber safety, including exploitation issues, gun and knife crime, as well as “Not in my name” which deals with anti-extremism and hate crimes. The schools will be from across North Yorkshire. 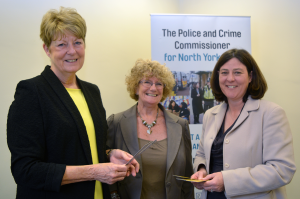 The main aim of this partnership project is to work specifically with women in the criminal justice system currently residing in Askham Grange open prison, as well as those within the local community. There are currently approximately 100 women residents at Askham Grange, who are encouraged as part of their resettlement plan to access arts courses that are run on evenings in the prison. Currently the project is working with 5 women at Yacro women’s project, 20 women at Lifeline and 10 at Changing Lives. Home-Start York is a voluntary organisation that provides practical and emotional support to families with pre-school children. Through a small part time workforce (3 members) and 48 volunteers, Home-Start support up to 100 families each year in York and surrounding areas by helping those who are experiencing difficulties in bringing up their children. 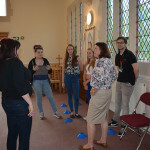 This project is being run by Thirsk Clock (known as The Clock) is an early intervention project based on meaningful restorative justice and will be aimed at two groups of young people; those who are at risk of causing anti-social behaviour, or who are actually engaged in anti-social behaviour. The project aims to fund skilled youth support workers to work with the young people. The Prince’s Trust supports 13 to 30 year-olds who are unemployed and those struggling at school and at risk of exclusion. The Prince’s Trust XL Clubs offer a personal development programme, delivered in partnership with schools and aimed at those at risk of underachievement, exclusion from school or entering the criminal justice system. The trust proposes to launch XL clubs with Danesgate PRU in York, Stokesley Secondary School in Hambleton and the Rubicon Centre, a PRU in Selby. This is a project by Northallerton & District Voluntary Service Association (NDVSA). Formed in 1979, NDVSA aims to stimulate and encourage voluntary work within the community by supporting other voluntary organisations; promoting liaison between the voluntary and statutory sector and developing new projects. The Wheels 2 Work project will target 16 – 18 year olds who may be in danger of becoming NEET (Not in Education, Employment, or Training) due to lack of transport or training. 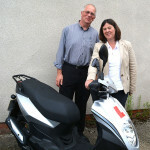 Wheels 2 Work is a moped loan scheme which aims to help users to overcome the initial problem of getting to work or training where no suitable alternative is available. Street Angels is a community project that enables people in the night time economy to be safe and feel safer, as well as generally making Scarborough a more pleasant place to be. This particular project aims to benefit the people of Scarborough, particularly Castle Ward and the town centre area. In particular it aims to help vulnerable people in the night time economy, benefiting those who wish to use theatres, cinemas, restaurants, bars and other night and evening facilities in Scarborough. It also aims to help local businesses by reducing damage and vandalism to local shops and creating a more positive atmosphere, thus encouraging more people into the local economy. Scarborough South Cliff Community Group is a new organisation, set up to promote and encourage a greater community spirit. Following a volunteer leaflet drop to all homes, hotels and businesses within the South Cliff area, the group has garnered about 170 members. The aim is to develop a community spirit by creating a safe forum to listen to the concerns of members, work with other agencies to promote a feeling of safety by reducing crime and anti-social behaviour, as well as the fear of such activity. The first main meeting was scheduled for mid-September. Barrowcliff Big Local Steering Group is a resident-led group set up in 2013 to oversee the 10 year Big Local Programme on the estate of Barrowcliff in Scarborough. The Barrowcliff Park project is to install a brand new flagship park in the heart of the Barrowcliff Estate on a former play area site between Briercliffe and Gildercliffe. This much needed facility will include state-of-the-art play equipment for all ages, equipment suitable for children with special needs, a ball court, seating and picnic area, and landscaped gardens. This is a project by the Craven Youth Council to provide a new state of the art skatepark that offers opportunities for users to take part in, share and develop their skills in a variety of wheel sports. A user led partnership including Craven Youth Council, friends of Airevillle Park, Craven District Council and North Yorkshire County Council are responsible for delivering the project to ensure the facility is accessible for all wish to use it. Competitions, events, professional coaching and peer mentoring will showcase skills and encourage new younger and female users to participate in all wheelsports. This is a project by the ‘DNA’ Young People’s Community, which is part of an Edge Community Project for Saint James Church Selby. The aim of the group is to provide a safe and fun environment for people age 11 to 16 years from Flaxley Road Estate to gather, as well helping young people to develop socially, mentally and physically, through the use of drama, film and other activity. After a successful film making project (‘From Despair to Hope’) the young people hope to set a small amateur film company with a significant number of people benefiting. The primary aim of In2Out is to reduce re-offending in the lives of young people leaving custody, aged 15-21. This will lead to lives that are more fulfilled and offer greater security into the lives of their families and children. Referrals are received weekly from young ex-offenders who want help in turning away from crime. The project needs office equipment including a printer to provide file copies of each beneficiary’s monitoring and progress, mentoring forms and handouts, and general printing. The fund will also provide signage for the building to increase awareness to visitors to the prison and furniture for the private meeting room. Since June 2012 Street Angels have patrolled the streets of Whitby every Friday night and the Saturdays of special weekends – such as bank holidays, Whitby Regatta and Goth Weekend. Their presence has been very much appreciated by those who work or who are out in the night time economy. They have started to cover some Saturday nights during the summer but would like to be able to go out every Saturday night as well as Fridays. The police and door staff have indicated that currently Saturdays are busier and our presence would be valued. More trained volunteers are needed to enable this to take place, with the funds being used to attract more volunteers and to provide training and clothing for the new volunteers. The Island is a registered charity, which provides a mentoring service to vulnerable young people aged 8-13 years in York. These young people are linked with fully-trained volunteer mentors, who, by means of weekly activity sessions, offer them, consistent one to one support over a period of 12 months. Currently, The Island is supporting over 50 vulnerable young people but has more than 60 others who meet the assessment criteria and are waiting for a suitable volunteer mentor to become available to them. The fund will be used to support two fortnightly clubs across York called “North Island” and “South Island”. Horizon Life Training is a Christian charity which guides people through their amazing journey of transformation, giving hope and purpose to those that have previously been excluded from mainstream employment, through the attainment of valuable life skills. Horizon Life Training aims to give former addicts an opportunity to take back responsibility for their lives, gain self-respect and support themselves financially. The project aims to turn the former Black Bull Public House at Kettlesing into a residential centre for 8 women on their “Transforming Journey”. The centre will not only provide them with a safe place to live, but also with work experience at the on-site coffee shop, acting as a stepping stone back into the community and to meaningful employment. Get Cycling is a registered not-for-profit Community Interest Company based in York and working nationally. Providing work experience and training for offenders, by becoming a high profile local enterprise with a dedicated training workshop and shop where donated and re-claimed bikes will be refurbished, re-cycled and re-sold. Working with up to 40 offenders per year, so contributing to crime reduction. The project will also offer bike try outs, promoting the health benefits of cycling, for local people and enabling people in deprived areas to become more mobile in terms of job search. North Yorkshire Sport is the Charity working to increase participation in sport and physical activity across North Yorkshire and to use the power of sport to reduce inequalities, improve health and promote social inclusion. WLCT is a charitable Trust providing Leisure, Culture and Wellbeing services operating in Selby. Get On Track uses experienced and trained ex professional athletes and local partners to engage up to 75 disadvantaged young people (aged 16-25), with 20 of those completing the full program. Achieving Potential Through Sport aims to mentor 15 young people through coach accreditation. Both elements improve self-discipline, motivation and confidence leading to enhance employability, reduced involvement in criminal/ anti-social behaviours and more active lives. The charity aims to assist ‘hard to reach’ military veterans who have been unable to reintegrate into civilian life. They may be suffering from post-traumatic stress disorder, homeless, abusing alcohol or drugs or engaging in antisocial behaviour. The project aims to help them rebuild their lives so they can reintegrate into society in a meaningful and sustainable way. The development of a database accessible through smartphones will enable 24 hour 0n-call staff access to the most up to date information enabling them to provide the best assistance possible. The group raise awareness about different aspects of modern day slavery through holding awareness raising events; lobbying MPs, businesses etc; and supporting third and public sector organisations working in the field. Over the last few years they have focused awareness raising activities on grooming and sexual exploitation of girls and young women, and more recently on staying safe and safe relationships. This project aims to distribute ‘Loves me Loves me not’ Safe Relationship resources across the region e.g. 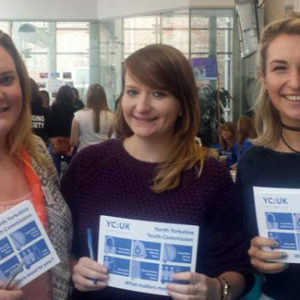 at college and University Fresher’s Fairs and safe relationship events, on UN special days such as International Day for the Elimination of Violence Against Women, and on National CSE Awareness Day. The City Wide Tool Marking Campaign has been launched, working in partnership with City of York Council & NYP. The aim of the project is to create drop in open days on the allotments throughout the spring/summer of 2015 to permanently mark-up plot holders tools and expensive equipment. There are 17 allotment sites across York authority, offering around 1500 plots, boasting approximately 90-95% occupancy that will benefit. The organisation carry out projects in the areas of Health, the Arts, Learning and Citizenship. Within the Learning and Citizenship area, they develop innovative projects to increase the active citizenship of young people and allow them to influence the decisions that affect them. Over the last two years they have collaborated with a number of PCCs to develop and pilot the ‘Youth Commission on Police and Crime‘ as a new model for youth engagement in the development of strategies for policing and crime. 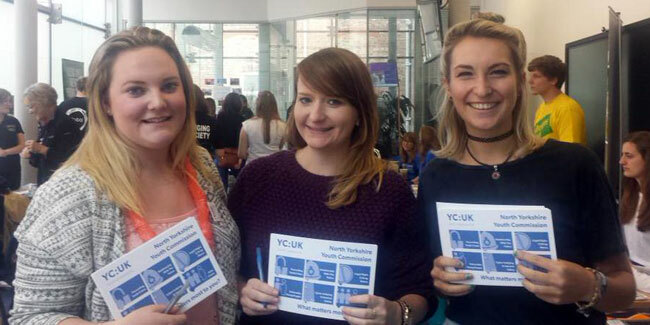 The Youth Commission aims to establish a sustainable, structured model for young people aged 14-25 to influence decisions about policing and crime in North Yorkshire. The main purpose of 141 Training and Therapy is to raise funds to support young and vulnerable people through various projects. Recycling of bikes to sell/hire to low income individuals. The project provides a non-judgmental, supportive workshop environment one day a week for community work placements for youth offenders currently under the Youth Justice Team. The aim is to support individuals by gaining and sharing skills, learning to work as a team, gain friendship, giving them confidence, self-esteem and independence. StageCraft is an inclusive performing arts project aimed at disadvantaged young people aged between 7 – 16 years old living in areas of deprivation and high crime activity. It is free at the point of access and is a diversionary and education activity targeted at those who have not participated in arts activities before due to cost or lack of confidence. The project will be delivered in 5 wards within the Scarborough Borough area (Castle, Eastfield, Barrowcliff, Edgehill, Whitby) engaging with 1500 people during the project with the opportunity to receive an accredited qualification on completion. The core work of the Home Improvement Agency and Handyperson Service is to adapt, improve and repair homes enabling people to remain independently, safely and comfortably in their own homes for as long as they wish to. 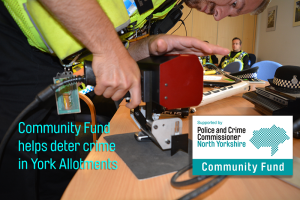 Providing free security advice, education and a security survey for all their vulnerable customers, the funding will allow fitting up to 3 free items of equipment e.g. door chains, window alarms at each property. Operating in Craven, Harrogate, Selby, Hambleton and Richmondshire, the service will survey 200 homes in each district. The organization are a Charitable After School and Holiday Club for five to 11 year olds. The project aims to encourage the fifty children, coming at varying times to participate in more sporting activities by teaching them that exercise is a fun way to work as an individual, in partnership and as a team player. The project also aims to attract older children and to keep them off the street and limit anti-social behaviour, which has been prevalent in the area.